The 2013 Breathless Agony was truly the best ever … and a big reason was our great team of volunteers, a record number this year. We had the best team of support people we’ve ever had the privilege of working with. Thanks to every one of them for all they did to make the day so fun and so inspirational to all of the riders. Check out the many dedicated volunteers we had this year at the bottom of this e-mail. and these riders often speak of how much they appreciate the Breathless Agony Support Team. If you have a Testimonial or Suggestion for us, please send it to Chuck … just reply to this e-mail. At the bottom of this e-mail is copied the names of all of the people who brought you the 2013 Breathless Agony and we appreciate every one of their efforts. We would like to complete our re-orders to our clothing manufacturer, Voler, by the end of this week on Friday, May 17, 2013. We can then place the order on Monday, May 20th, and receive the clothing by the end of June. which has been updated with all clothing options for 2013 as well as prior years. And they are Breath-Takingly Beautiful!! If you were a 4 Pass Finisher this year or a prior year, you NEED one of these Jerseys and deserve to wear it with pride in your accomplishment. This is a breath-taking Red, logoed T-Shirt showing the Grim Reaper chasing you on the Breathless Agony Course as well as "Now - Go Elevate Yourself" on the Front. This high-quality T-Shirt was designed by Robert and Jill Kahler and is available for sale now as well. The T-Shirt is available for $20. Newly designed Breathless Agony Socks are $8.00 a pair and will give you a 1.73 MPH increase in your Average Speed. If you wish to fax the order in with credit card info, the FAX # is (714) 204-0357. Another option is for you to order directly by calling Robert at Kahler Cycling Academy at (714) 713-9557 during week days from 11:00am to 4:00pm. so you’ll be kept all up to date on the Breathless Agony. We have many more photos and videos to share. As you know, we had a new product called “Elevation Fuel” available at the Rest Stops to mix into your Water Bottles this year. This is a new product from a small startup company that we have tested extensively in our cycling and we believe it will take your endurance to the next level. There were 3 flavors: Orange, Black Cherry, and Berry. It was packaged in 3 ounce serving sizes that you could easily add to your water bottle giving you 150 calories of long chain good burning carbohydrates. The results of this survey will help determine if we carry this product in future Breathless Agony Century Rides. On Friday morning 5/03/13, Weather.com had forecasted Redlands to be a high of 83 degrees with a 0% chance of showers in the morning, Beaumont to be a high of 80 with a 0% chance of showers, Angelus Oaks to be a high of 73 with a 0% chance of showers, and Big Bear to be a high of 69 with a 0% chance of showers. We all lucked out and the weather was excellent. Yahoo for you!! Yahoo for our support team!! We served over 8,000 Pounds of Food much of which was supplied by our wonderful sponsor, Bristol Farms, including those beautiful fresh Strawberries at Onyx Summit and that great lunch at Sylvan Park. We served 600 Gallons of Crystal Geyser water this year which was supplied by our wonderful sponsor, Smart & Final. The day started off with a “ROCK PARTY” at Sylvan Park. Each rider starting the Breathless Agony Ride received a beautiful pair of Breathless Agony Socks. These look really cool while cranking on your bike!! Nate Whitman from Los Angeles and David Bruemmer from Carlsbad are interviewed at Onyx Summit after tying the Overall Course Record in 4:35 on the 2013 Breathless Agony Century!! Athena Countouriotis from Carlsbad is interviewed at Onyx Summit after she broke the Women's Course Record by completing the 4 Pass Course in 4:54!! Alex Estrada and Deya Guerrero are interviewed at Onyx Summit after setting the new Mixed Tandem Record in 4:52!! All kinds of records were going down on the 2013 Breathless Agony Century. Greg Vizzini from Yucaipa is interviewed after he bought his first bike last August and flew up to Onyx in 5:21. Onyx Summit Chief Engineer, Kevin Morningstar, is interviewed about a Major Breakthrough. Mike Joyce from Irvine is interviewed after completing the Breathless Agony just 6 months after a Complete Knee Replacement!! Colin and Julie Stokes are interviewed about Breakfast and Bacon. Lee Cardon may well be the most inspirational rider of 2013. Not only did he ride the whole course elevating himself up to 8,443 feet in 6:36, he rode it with ONE LEG. His other leg is a custom built Giant Carbon Fiber leg. Thanks to Lee for his great inspiration. Martin Ward talks about his ongoing Love / Hate Relationship with the Breathless Agony. Joel Sothern is interviewed at the Onyx Summit sign and discusses how he’s getting stronger every year at age 56. Frankie Holt’s Fun Ride Report is linked to on that page. Check out the 105 year old woman who says that Bacon is the key to her longevity ... thanks to Scott Palka for sharing. We are most grateful to the great team of volunteers who made this most difficult event not only possible but mighty fun!! We tip our hat to all of the riders who completed the full 4 Passes on the 2013 Breathless Agony Century. In the Men’s Division, Nate Whitman from Los Angeles and David Bruemmer from Carlsbad tied the course record of 4:35!! In Third Place was Joel Sothern from Thousand Oaks who flew up from Sylvan Park to Onyx Summit in 4 Hours and 44 Minutes, just 5 minutes off his 50+ Course Record which he set last year. In the Women’s Division, Athena Countouriotis from Carlsbad set the Women's Course record in 4 Hours 54 Minutes on the 2013 Breathless Agony Century!! The record was previously held by Deya Guerrero who rode the course in 5 Hours 5 Minutes in 2012. In Second Place in the Women’s Division, Tracy Tilton from Tustin completed the course in 5:05. In Third Place in the Women’s Division, Mary Dannelley from Irvine cranked out a 5:11. 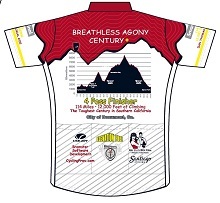 Kudos to the Tandem Teams who tackled all 4 Passes of the Breathless Agony Century!! This is NOT a tandem friendly ride. 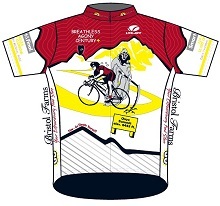 We had only four tandem teams riding the 2013 Breathless Agony. Alex Estrada and Deya Guerrero from El Cajon set the new Mixed Tandem Course Record in 4:52. They shattered their own prior record of 5:12!! Father and Son team, Kipling and Aaron Sharpe, from Mesa, Arizona, completed the entire course and Aaron is only 14 years old!! We tip our helmet to William Anderson from Mission Viejo who at age 70 set the 70+ Course Record in 5:14. The record was previously held by Rex Farnsworth who rode the course in 6:49 in 2011. William’s amazing ride this year also beat the 60+ Record which was 5:26 so William holds both the 60+ and the 70+ Course Record!! www.BreathlessAgony.org has been updated with the date for 2014 which is Saturday, May 3, 2014 6:30 A.M.
Mark your calendar: Registration for the 2014 Breathless Agony will open on Monday, 1/13/14 at 8:00 P.M.
We will open registration right here at 8:00 at night in order to allow most riders to register from home so they won't have to do this at work and possibly be unable to register due to corporate firewalls. Last but not least, we heard many reports of some amazingly good vibes out on the course. Faster riders who started later were cheering on the slower riders as they past them. How cool is that? The atmosphere was very cool, the optimism was everywhere, and we appreciate those good vides so much. Everyone out there is to be commended. This is a very difficult but beautiful ride. We hope we took your breath away!! "Climbing 1690 feet in about 8km at an average grade of 6.7 percent, Oak Glen is a hard climb for March." Of course, on the Breathless Agony, the Oak Glen Climb is only Pass 2 … it just a warm up for the longer, endless climbs to follow. The Breathless Agony is truly agonizing with most of it's climbing in the 30 miles from the Mill Creek Ranger Station to the top of Onyx Summit ... a "brute of a climb that just goes up and up." From the start in Redlands, you’ll be climbing over 12,000 Feet in 114 Miles!! It was just a phenomenal day of cycling and we were mighty proud to be a part of it. There are a lot more photos with the Grim Reaper and amazing athletic accomplishments forthcoming. A HUGE Thanks to all the volunteers who made this possible!! These folks gave it 100% and we want to sign off this e-mail like the credits to a movie with a list of these great folks who made the 2013 Breathless Agony so excellent and so fun. Kathryn Major, "Mrs. Mayor of Jack Rabbit"
At the Finish Line at Sylvan Park in Redlands, the Massage Therapists from CyclistsMassage.com helped the Lunch Team and provided massage therapy to the riders. Thanks to each of these great people who made the 2013 Breathless Agony such a success!! “Can we climb this mountain?